St Mary’s has its origins in Christian social action. In 1865 two Hampstead businessmen, moved by the sight of starving children on street corners, opened a home for destitute boys in Regents Park Road. Services in its iron church in nearby Ainger Road proved so popular with local people that it outgrew its premises and the present brick church next to Primrose Hill itself was built. 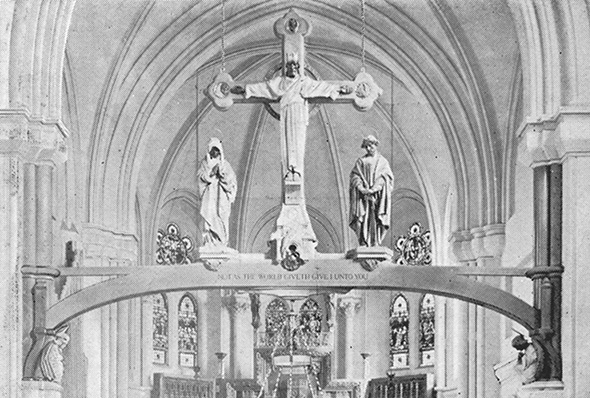 This was opened for worship on 2 July 1872. Musically, St Mary’s enjoys a unique place in the story of Anglican worship. In 1906, this is the church where Percy Dearmer (Vicar 1901-15) worked with Ralph Vaughan Williams and Martin Shaw to compile The English Hymnal. It was in Primrose Hill that congregations first sang many well-loved hymns such as ‘He who would valiant be’, ‘In the bleak mid-winter’ and ‘Dear Lord and Father of mankind’. Dearmer made St Mary’s the show-piece for liturgy according to the English Usage. Our worship continues to be full of music, colour and ceremonial. Worship in the catholic tradition of the Church of England, good music, and a concern for children and young people continue to be hallmarks of St Mary’s. But church is not simply about Sunday. As Christians we want to make connections between our faith and the way we live and work. In partnership with our church school, St Paul’s, we strive to reach out to local families. We have a thriving Sunday School and an imaginative youthwork programme. Our Social Inclusion Programme is a contemporary expression of what the two Victorian businessmen were seeking to do in their generation. Above all, we want people to be fully alive as human beings, and so give glory to God.